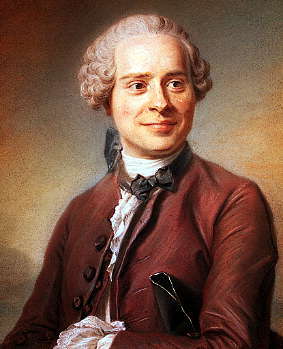 Jean-Baptiste le Rond d'Alembert was a French mathematician, born on 16 or 17 November 1717 in Paris, and died on 29 October 1783, also in Paris. His father was an artillery officer, but his mother was much more interesting. Having been a nun, she sought papal dispensation in 1714 for a new career as a fun-loving socialite, benefiting from the new government banknote printing scheme of John Law. She left her illegitimate child on the steps of Église St Jean Le Rond de Paris, whence he was taken to an orphanage. When his father returned from duty, he arranged for the boy's care. 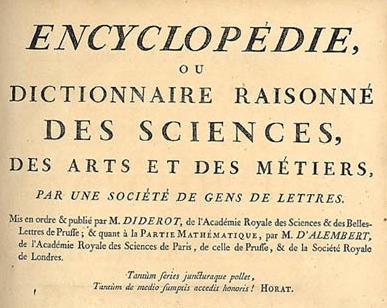 Perhaps d'Alembert's greatest contribution to the world was helping Denis Diderot 'change the way people think' by editing the great Encyclopédie, ou Dictionnaire raisonné des sciences, des arts et des métiers of 1751. There were many contributors, but d'Alembert was listed as co-editor on the title page (left). This book was an essential ingredient in spreading the Enlightenment across Europe, and d'Alembert was closely involved in the project for at least a decade. I imagine he died feeling a little hollow about his work on waves, unaware of the future impact it would have—not just in applied geophysics, but in communication, medicine, engineering, and so on. For solving the wave equation, d'Alembert, we salute you. Read more on Wikipedia and The MacTutor History of Mathematics. D'Alembert, J-B (1747). Recherches sur la courbe que forme une corde tenduë mise en vibration. (Researches on the curve that a tense cord forms [when] set into vibration.) Histoire de l'académie royale des sciences et belles lettres de Berlin, vol. 3, pages 214–219. Read on Google Books, with its sister paper, 'Further researches...'. Portrait is a pastel by Maurice Quentin de La Tour, 1704–88.